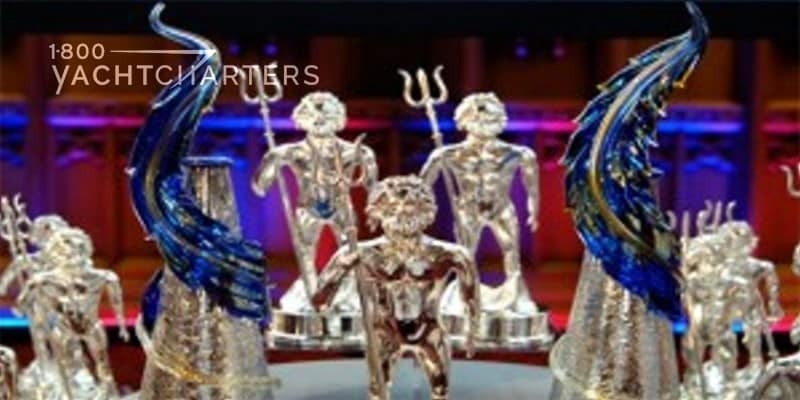 The buzz continues to build around the nominees for the 2011 World Superyacht Awards. It is an annual ceremony that fêtes many of the Newest and Largest Yachts. It is hosted by the editors of Boat International Media. The awards finally honor the finest new vessels delivered to their owners in the past twelve months. Above all, it is considered the “Oscars” of the megayacht industry. The ceremony scheduled for May 7, 2011 will be attended by an elite guest list of owners from around the globe and the most influential players in the business of boats. It sometimes seems sail boat charters take a back seat to their motor yacht rivals. Consequently, a privileged few will be fortunate enough to experience sail yacht PANTHALASSA under sail. 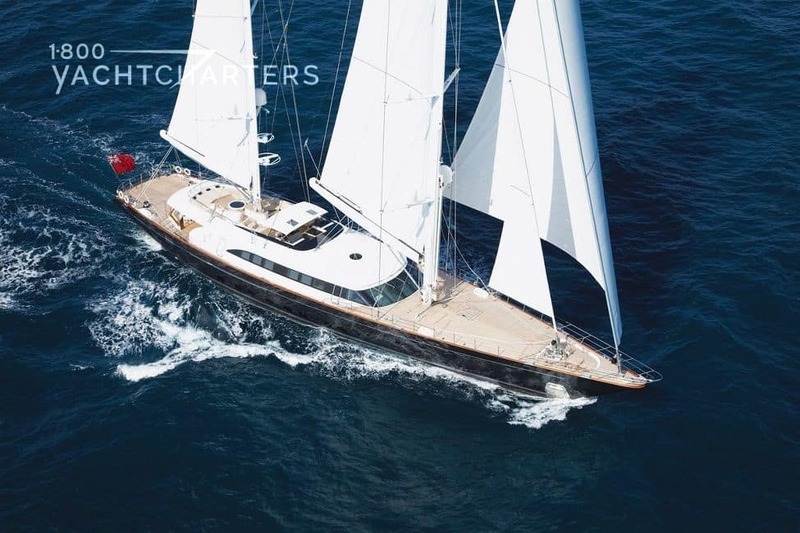 The 56 meter megayacht is nominated for Best Sailing Yacht in 45 meter and up category. The vessel presents a fusion of contemporary living and the finest nautical heritage. Her interior is luxurious and features a rich contemporary decor. She is delightful to the eye and soothing to the soul. Sail mega yacht PANTHALASSA reflects an outstanding creative synthesis between Perini Navi and Foster & Partners. Natural daylight suffuses the interior of the superyacht. She has unique skylights that channel light from the sundeck and oversized portholes. The clean lines and uncluttered style of her interior offer contemporary living. 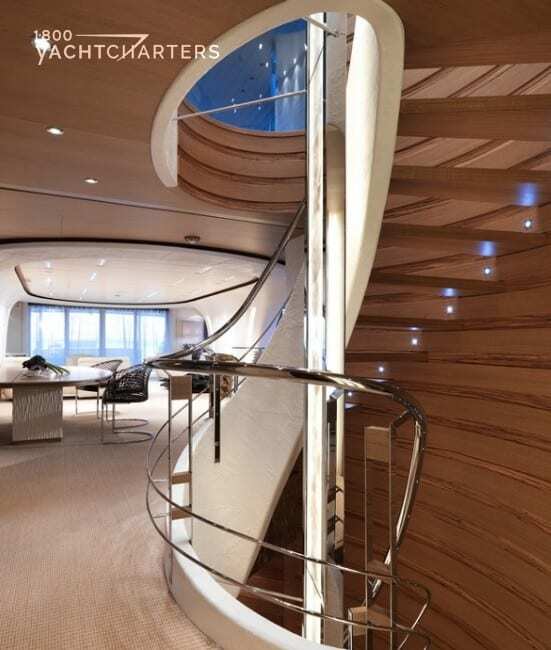 Central to the luxury yacht charter vessel is a flowing stairwell. It is wrapped in a translucent acrylic enclosure that alloows light into the main saloon. A tactile and warm ambiance is created through the use of warm, natural organic tones and the combination of teak flooring with saddle leather wall paneling and granite surfaces. Flexible multifunctional spaces offer a host of well conceived opportunities for social interaction or intimate gatherings. the dining table can become a coffee table. Nearby, the library is positioned with views over open water for a feeling of deep relaxation and enhancing contemplation. The boardroom with its video conferencing facilities is also a perfect dining area and the sweeping sofa in the saloon becomes a bar. 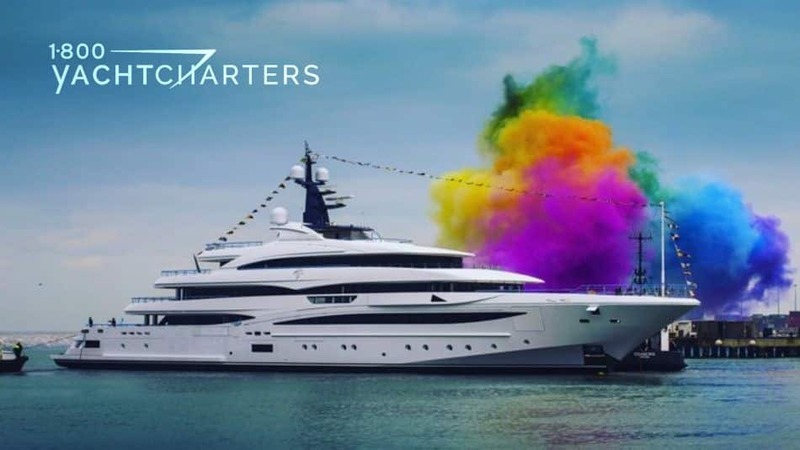 The ability to conduct business while onboard makes this superyacht the perfect special event charter vessel, and an ideal candidate for MIPIM, the Cannes Film Festival, and finally, the Monaco Grand Prix. Electric glazed screens allow the entire main saloon , dining area, and wheelhouse to be divided or unified into a one large living space. 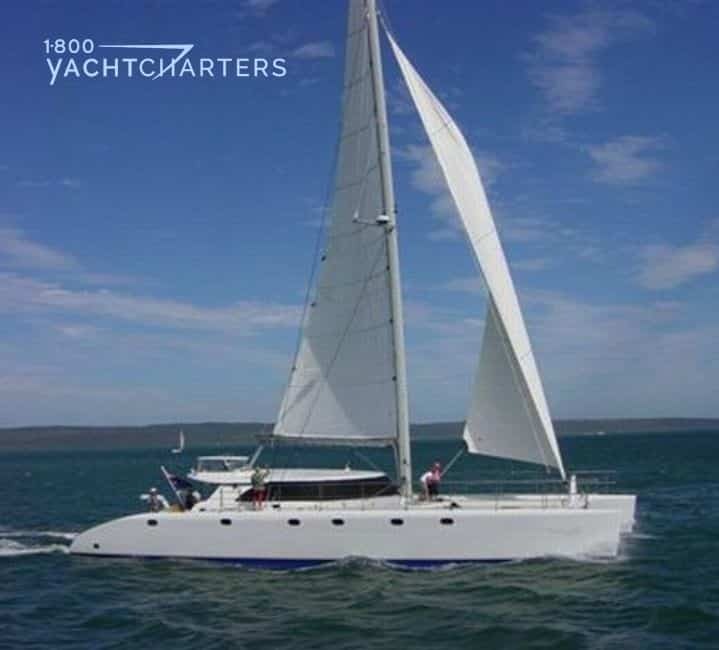 Contact our vacation specialists at https://www.1800yachtcharters.com/book-now-contact-us/ to reserve sail yacht PANTHALASSA or any other in our inventory. The finalists for the 2011 World Superyacht Awards have been selected, and many of the newest and largest yachts available for crewed yacht charter have been nominated. The awards honor the finest new vessels delivered to their owners in the past twelve months. They are hosted by the editors of Boat International Media. WHAT ARE THE WORLD SUPERYACHT AWARDS? The awards are considered the “Oscars” of the megayacht industry. The ceremony is attended by an elite guest list. For example, attendees include owners from around the globe and the most influential players in the business of boats. Sixty meter ISA MARY JEAN II is nominated for Best Displacement Motor Yacht of 500GT to 1,299GT (approximately 50m – 59m). She is sure to be a star of the 2011 Croatia yacht charter season. 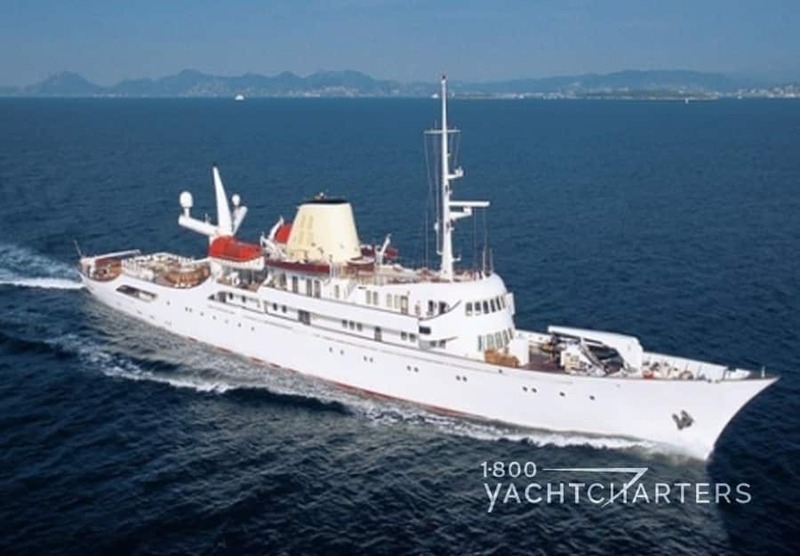 WHO IS YACHT MARY JEAN II? The vessel was built, designed, and engineered by International Shipyard Ancona (ISA). She accommodates up to 12 guests in 7 cabins. This yacht works with a crew of 14. MARY-JEAN II features the latest technology and design. She has a light and spacious interior, and she maneuvers well. MJ II excels in comfort, interior, and on-deck entertainment. Not only that, but she excels in toys and tenders, and finally, overall efficiency. The vessel sports a striking Aristo blue hull and Oyster white superstructure. She utilizes the latest technology, design, and Italian craftsmanship, boasting elegant lines with an impressive stern. With a beam of 12 meters, M/Y Mary-Jean II offers generous interior volume and comfortable living spaces. Her contemporary interior was designed by Mark Berryman and features split bamboo paneling and rustic limestone mosaics. She also features classical elements onboard, notwithstanding, a teak backdrop and contrasting wenge wood. Neutral fabrics are contrasted by more vibrant colors in the owner’s artwork and in colored scatter cushions. Subsequently powered by twin Caterpillar engines, motor yacht Mary-Jean II can reach a top speed of 16 knots and cruises comfortably at 15 knots. Contact our 1-800 Yacht Charters reservation team at https://www.1800yachtcharters.com/book-now-contact-us/ to secure prime summer holiday dates on this yacht or any other in our inventory. 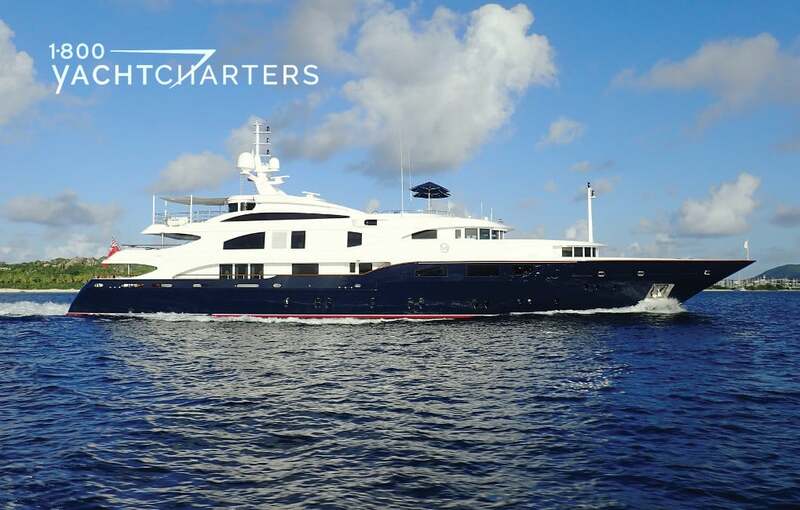 Recently, we introduced you to sportfish yacht BIG FISH, an expedition vessel designed for luxury yacht charter with a serious cruising agenda. Edgy, angular, and dramatic, above all, mega yacht BIG FISH is devoted to sea-going adventure. After making her public debut in the background at the 2010 Ft. Lauderdale International Boat Show, the vessel has set out on an around-the-world odyssey. Currently, she is underway to Cape Horn, namely, the southernmost headland of the Tierra del Fuego archipelago of southern Chile. By September, the superyacht will enter the Pacific. She will have undergone an epic 40,000 mile maiden voyage, including the first yacht transit of the fabled Northeast Passage. After which, once in the Pacific, we will arrange charters in Japan. Few travelers realize Japan’s 6,784 island archipelago stretches 1,700 nautical miles from a New England-like climate in the North (with destinations that better the best of the Mediterranean). It moves to the sub-tropical south, complete with white sand beaches, coral reefs and crystal clear waters to rival the best of the Bahamas and Caribbean. Finally, the yacht offers accommodations for 10 guests. She is priced from $195,000 per week. Charteryachts prove winners at Design Awards over private boats. Elegant CMN Yacht CLOUD 9 was just one luxury yacht charter vessel to catch the attention of the judges at the recent ShowBoats Design Awards. Of the 10 winning private yacht entries, 6 are currently available for either Caribbean or Mediterranean yacht charter. The newest and largest yachts in the rental marketplace improves every year, as owners push the design envelope to new heights. The inaugural yacht awards ceremony took place in October at the exclusive Mar A Lago Club. The facility is Donald Trump’s private club in Palm Beach, Florida. It was sponsored by ShowBoats International. It began with a two-day Superyacht Design Symposium. On the 3rd day, 350 guests enjoyed an evening of cocktails. The evening also featured a gala dinner and an awards ceremony honoring the yachting industry’s creative talents. Those talents included architects, designers, stylists, craftsmen, and innovators in yacht technologies. ShowBoats Design Awards came about as a former part of the Boat International Media World Superyacht Awards. They introduced a number of new categories. 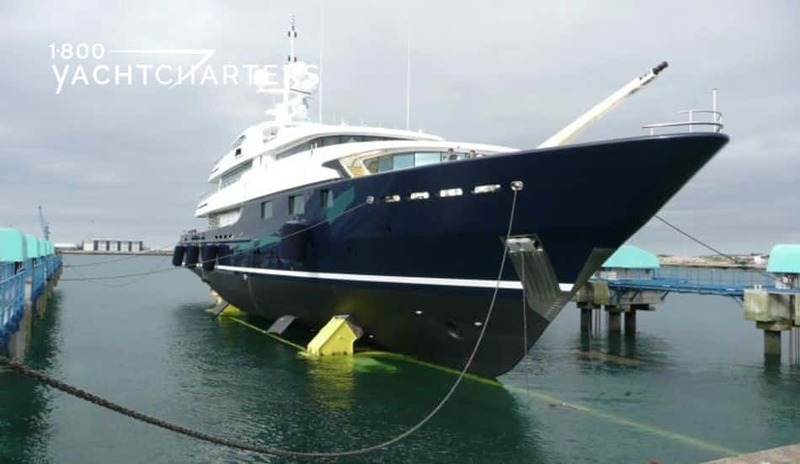 The jury included 4 superyacht owners, 2 naval architects, a senior yacht captain, an experienced yacht chef, and six design professionals with no links to the industry. The awards resulted from more than 200 yacht nominations. The next yacht award event is the 2011 World Superyacht Awards, and it will be hosted by the editors of Boat International Media. The awards honor the finest new vessels delivered to their owners in the past twelve months. The award presented is The Neptune Award, or the “Oscar” of the megayacht industry. The ceremony is scheduled for May 7, 2011, and it is attended by yacht owners from around the globe. Others who attend are influential players in the boating business. 62 finalists are in contention to receive a coveted Neptune Trophy, including the 56-meter Panthalassa and the 60-meter MARY JEAN II. We are pleased to announce CMN Yacht CLOUD 9 received two trophies during the recent ShowBoats Design Awards. The 60-meter superyacht and her designer Andrew Winch took two tropies. The first, the award for Best Exterior Design & Styling Award – Motor Yachts. The second, for Best Interior Recreational Area. A two-day Superyacht Design Symposium was held. After the symposium, 350 guests gathered for an evening of cocktails, a gala dinner, and anAwards ceremony honoring the industry’s creative talents. Those awarded specifically include yacht architects, designers, stylists, craftsmen, and innovators in yacht technologies. Cloud 9 catches the attention of the judges for her clean, simple, chiseled elegance. 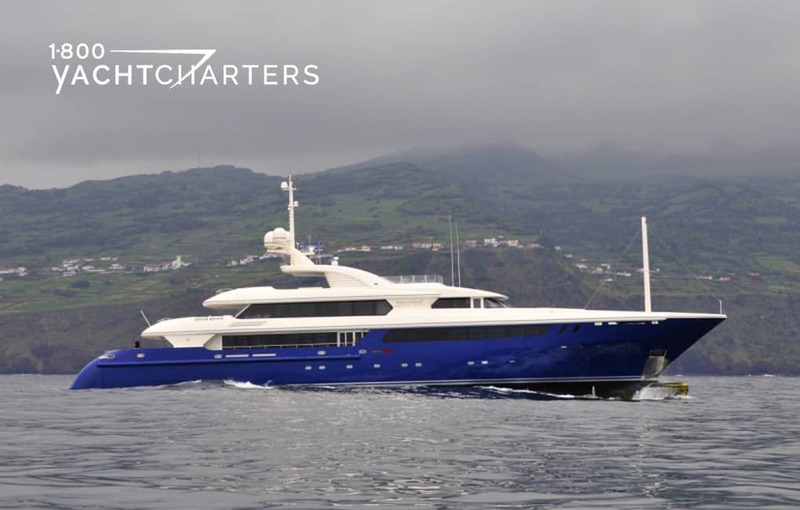 She is new to the yacht charter market, with just two Mediterranean seasons under her chartering belt. Judges remark upon her well laid-out decks. The decks facilitate ease of movement. Her seamless windows, port and starboard, reflect the sky and sea. Cloud 9’s aft bridge deck has a huge salon with cinema. It also offers informal indoor/outdoor dining area. Judges find an ingenious solution for the 11 foot cinema screen, for instance, the way it rolls into the back of the daybed. They note that the open-plan style nevertheless allows for more intimate groupings. Space includes the games table, sofa, daybed, and on the aft deck. CLOUD 9 is available for charter in the Indian Ocean. Her rate is Euro €315,000 per week, plus all expenses. Would you jump at the chance to enjoy a summertime Benetti yacht charter in the middle of the winter???? Well now you can – in warm, sunny New Zealand. 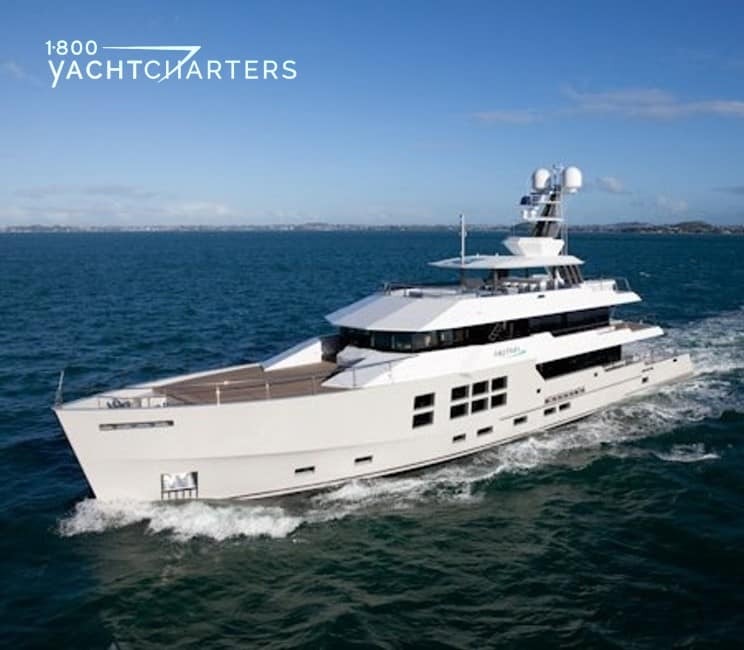 New Zealand is just coming into full summer, and one of the largest yachts in charter is available to explore this exotic destination. Warm waters , warm days and cool nights are the hallmark of the area. Winter in the USA is an ideal time to discover this unique cruising ground. From the Bay of Plenty to the Bay of Islands , the region offers pristine beaches, volcanoes, mountains and stunning scenery (as seen in the Lord of the Rings trilogy). The 56 meter (183ft 8in) Benetti motor yacht GALAXY will call this area home for the next 4 months. The superyacht boasts room for 12 guests. The owner’s suite is on the main deck, with a panoramic saloon in its forward part. The VIP cabin is located on the upper deck, while four more guest cabins are on the lower deck, in the form of two doubles and two twins. The interior decorator has specified a variety of exotic woods for this yacht such as eucalyptus, sycamore, plane tree, maple, platanier. Motor yacht GALAXY has an elevator running the lower deck guest from lobby all the way up to the sun deck. The lift carries four people at a time, and the shaft being in glass, tends to act as an atrium, carrying light through the heart of the yacht. The lift to the sundeck is built into the gymnasium. This floating villa is in Bristol condition and led by a seasoned skipper, Captain Dughall MacLachlainn and a crew of 14. Her weekly rate is €255,000 plus expenses and NZ tax. Click here to BOOK GALAXY NOW. If you are dreaming of taking a crewed catamaran charter vacation soon, look no further than the this Lidgard multihull. 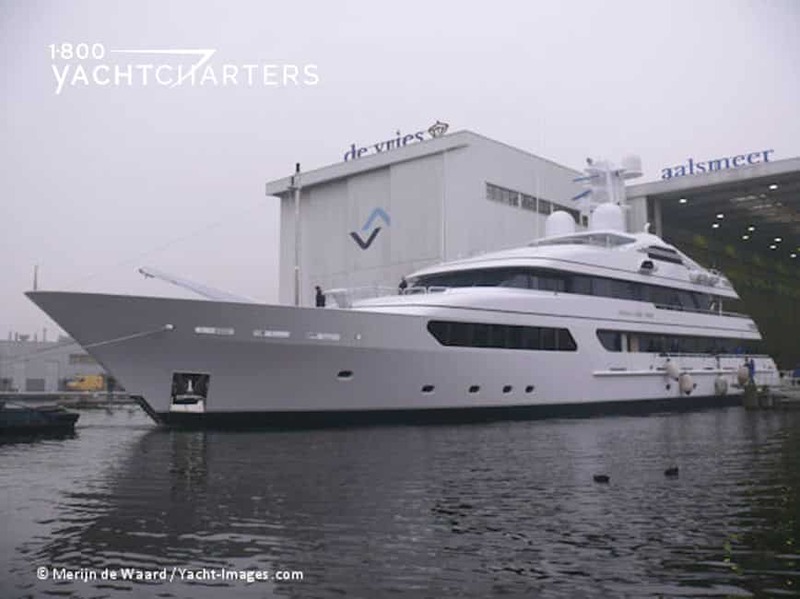 She is the ideal charterboat, as she stands at an impressive 73 feet. She comes with tastefully-designed interiors of marble and teak. The fittings used on this sailboat are superior and complement the skilled craftsmanship used in the handcrafts. There is an abundance of space on the Executive 73, not to mention the first class service of its three man crew. If you love speed, you will love this catamaran, as she can reach speeds of up to 18 knots for an exhilarating sailing experience on the Mediterranean! Click https://www.1800yachtcharters.com/book-now-contact-us/ to book your private luxury yacht charter vacation aboard a charter yacht. As a destination, Greece is a sensory celebration. It’s a dance with history and ancient gods, and a courtship between natural beauty and modern luxuries. It’s also an invitation to indulge in a slower pace and simpler pleasures, like savoring a taverna meal complemented by a fantastic local wine you’ve most likely never heard of. Of course, the ideal way to explore the myriad of small Greek islands is to rent a private yacht. For travelers with experience at the helm, a bareboat charter is the most affordable option for exploration. Similar to renting a car, you do the “driving” by serving as your own skipper. Yes, you and your travel companions must also do the cooking and cleaning, but when it comes to saving money, it is hard to top the appeal of a bareboat charter, especially sail boat charters as compared to power boats. If you are not qualified to operate your own boat, or simply desire a hire level of comfort and amenities, some of the largest yachts in the world can be rented in the land of the gods. The famous yacht CHRISTINA O calls Greece home. The private vessel of the late Greek shipping tycoon, Aristotle Onassis, this yacht offers huge deck spaces and the indulgence of an original mosaic-tiled swimming pool. In addition to the Jacuzzi, there are three public lounges, a gym, and a game room – and the famous bar where Sir Winston Churchill first met Jackie Kennedy. When to go to Greece? Jana Sheeder, President of 1-800 Yacht Charters recommends visiting Greece between May and October. When to book a yacht charter in Greece? NOW is the time to make your 2011 Greece yacht charter reservations. Lady Michelle, one of the largest Trinity yachts in the international yacht charter fleet, is now available for an unforgettable vacationing experience. Reaching speeds of up to 19 knots, Lady Michelle can comfortably accommodate up to ten yacht charter guests in her five luxurious staterooms. With a crew of nine, you are guaranteed first class service throughout your cruise aboard Lady Michelle. Some of the highlights of this luxury yacht include the panoramic sky lounge which opens to a covered exterior deck aft on the pilothouse level, and al fresco dining for twelve. Everything about Lady Michelle speaks of elegance and is sure to make your cruising vacation truly unforgettable.